Attractive chalet situated in Méribel village just 150 metres from the Lapin ski slope and the Golf chairlift. The combination of traditional stone and wood along with the central fireplace create a warm and convivial ambience ideal for families and there is a leisure spa area with an indoor Jacuzzi and steam room for relaxing. There is a bus stop nearby and the shuttle takes just five minutes to the resort centre. Self-catering (catering optional) chalet accommodation covering 180 m² on 4 floors for 10 people (8 adults and 2 children under 12 years old), 5 bedrooms, 4 bath/shower rooms, wifi. The lower floor -1 has a children’s bedroom (with two 90 cm x 190 bunk beds), sink, television and DVD player. Shower room with walk-in shower and separate toilet. Leisure area with sauna and steam room. Laundry room and skis and boot storage room. The ground floor 0 has a lobby. Twin bedroom (with two 80 cm x 190 beds) with television and en-suite bathroom with hairdryer and toilet. Another twin bedroom (with two 80 cm x 190 beds) with television. Another twin bedroom (with two 80 cm x 190 beds) with television. Bathroom with hairdryer and a separate toilet. The first floor 1 has a light spacious high ceiling living and dining room with central fireplace, bar and fully equipped open plan kitchen (with dishwasher, Nespresso coffee maker, induction hob, oven etc.) all opening onto the south facing balcony which offers fantastic views of the valley. The second floor 2 has a master twin bedroom (with two 80 cm x 190 beds) with television and en-suite shower room with walk-in shower, hairdryer and independent toilet. Study area with printer. Meribel village centre 100 metres. Nearest ski slope and ski lift 150 metres. Méribel resort centre and ski school 3 km. Chambery airport 100 km. Geneva and Lyon airport 180 km. Albertville and Borg-St-Maurice railway station 45 km. Moutiers railway station 20 km. 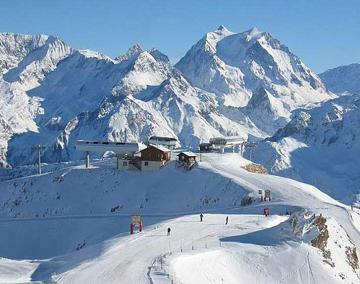 There is extensive skiing both in Méribel and beyond on the 3 Valleys ski pass with over 330 groomed slopes which have plenty of variety and rise to an altitude of 3220 metres. The resort is mainly geared towards families and there is excellent ski instruction both in French and English. Security deposit 2000 euros by credit card slip not cashed unless required. Tourist tax.